For the second hour of today's show, Marc spoke with Thomas Cahill, author of A Saint on Death Row. For the second hour of today’s show, Marc spoke with Thomas Cahill, author of A Saint on Death Row. 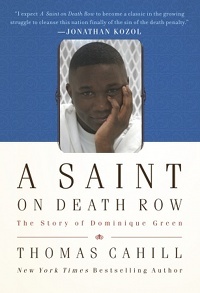 This new book focuses on the true story of Dominique Green, a young Black man, who was sentenced to death after being found guilty of murder by a jury with no African Americans on it. Although Green maintained his plea of innocence, he was executed on October 26, 2004.